Is the victim a male or female? NGSS Life Science DCIs LS1, and LS2. This lab provides students with experience with the process of epiphyseal union as well as using Vernier calipers. Students will be given a few bones, and then take the role of a forensic anthropologist to determine as much information as possible about the bones to help identify the individual. Students will become familiar with some of the techniques performed by a forensic anthropologist as well as some of the challenges one may encounter along the way. Framework Science Standards (LS2), (LS3), and (LS4) are all utilized in this lab activity (Ecosystems: Interactions, Energy, and Dynamics, Heredity: Inheritance and Variation of Traits, Biological Evolution: Unity and Diversity). This kit has been aligned with all published National Standards. Pre- and Post-laboratory assessments and vocabulary words all target specific Science and Engineering Practices and common core standards. The teacher guide also contains specific "Did You Know" concepts that link the real world with scientific standards explored. A student copymaster is also included. The lab activity booklet can be used with this kit and our additional bone sets, as well as bone sets that you may already have in your classroom. This kit includes enough materials to be used repeatedly. 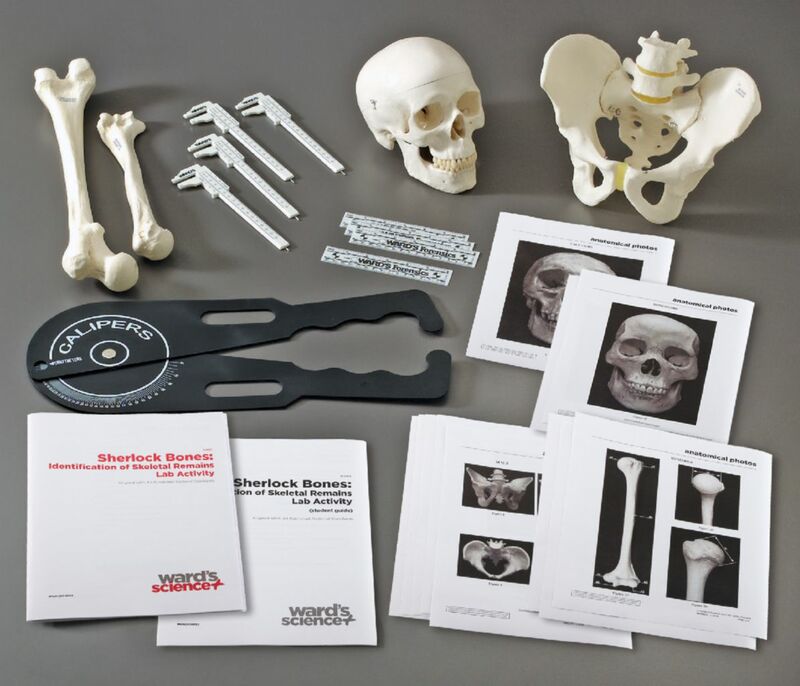 Ordering information: Kit contents include Plastic skull, Plastic humerus, Plastic pelvis, Plastic femur, Large caliper, Protractors, Vernier calipers, Metric rulers, Teacher's Guide, and Student Guide. 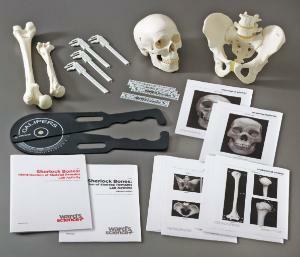 The bones included with this kit were cast from a 25 year old Caucasian male who stood between 5'0" and 5'9" tall. This activity takes approximately 45–60 minutes to complete.